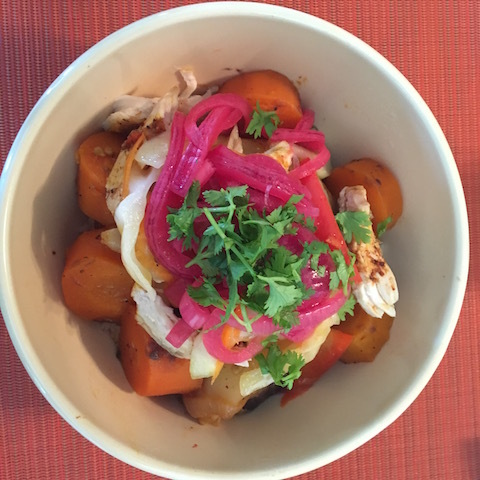 Beautiful Pickled Onions Atop … Anything & Everything! I’ll admit it – I have been holding out on you. But I figured it was finally time to let you in on the easiest, tastiest, and bestest condiment out there: lime-infused Burmuda onions. I make these onions often when I do my weekly “mise en place” preparation…along with toasted nuts, toasted seeds, homemade croutons…doing a lot ahead of time is what makes meal prep quick and easy for me. I’m not a raw onion lover, ever. These still maintain their crunch but lose the bitter onion flavor as the lime juice removes the harsh aftertaste. 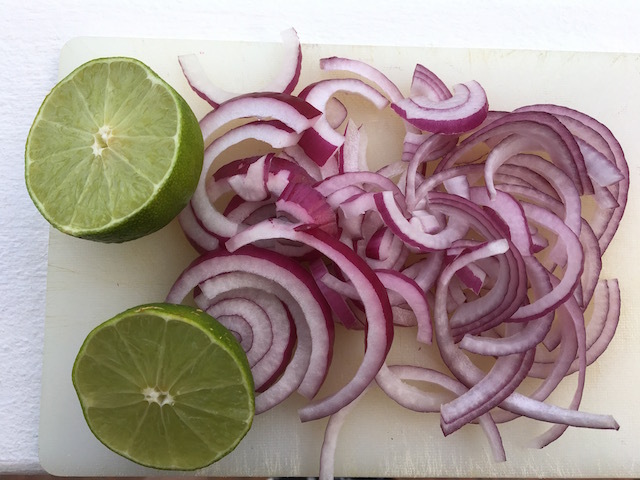 So here is the deal…I have embraced this way of pickling red onions because they are delicious, prep is simple and the onions stay crunchy. But too – there’s the color. They transform from a gorgeous, deep purple to a beautiful, bright magenta. And when you pile these on a sandwich (My favorite is hummus and arugula) , on any kind of burger, on fish or chicken or meat, as a finish for rice or grains, in an omelette…suddenly the colors pop and whatever you are serving looks much, much more appealing. Summer, fall, winter or spring…there is nothing like these onions! These literally take five minutes to prepare, so there is no reason not to try them. Put all the ingredients into a glass jar or glass container with a lid and stir together. Leave at room temperature for an hour , stirring every 15 minutes. The onions will shrink in volume and produce juice. After an hour, cover well and keep in the refrigerator. Use these as often as you can and make them again and again. Mine keep well for up to a week or even a bit more. This entry was posted in Condiment and tagged Bermuda Onions, Lime. Bookmark the permalink.